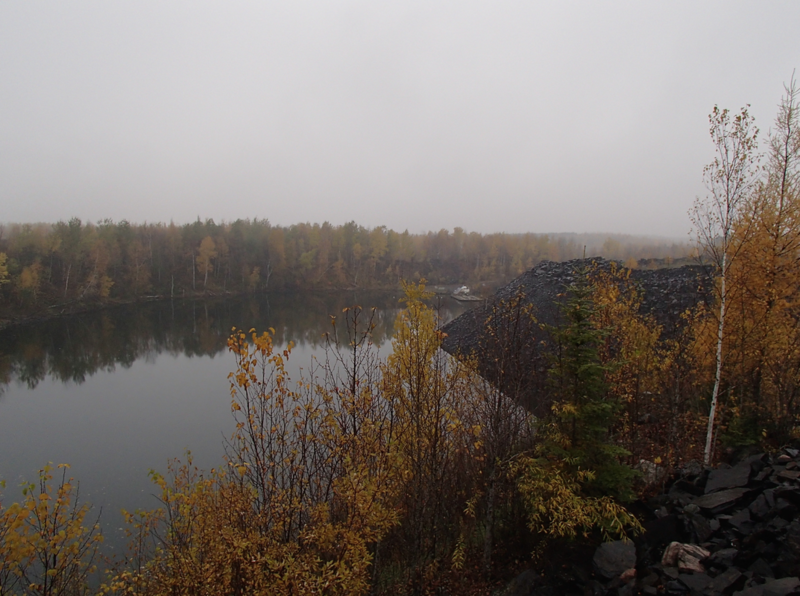 The Duluth Complex is thought to contain the world's largest undeveloped source of copper, nickel, and platinum group elements, and the first of several proposed mining operations is currently under environmental review. We are studying the microorganisms and microbial processes involved in the oxidation of Duluth Complex sulfides, starting with a project on the microbiology of long-term (15+ year) weathering experiments that were initiated by the Minnesota Department of Natural Resources (DNR) (pictured at the right and below). Above, left: Outcrops of the Duluth Complex in Northeastern Minnesota. Photo from a recent University of Minnesota workshop. 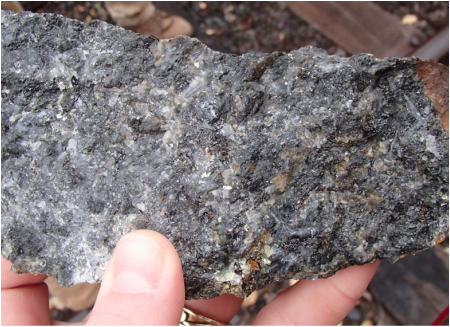 Above, right: iron and copper sulfide minerals (pyrrhotite and chalcopyrite) visible in a hand sample of Duluth Complex rock. 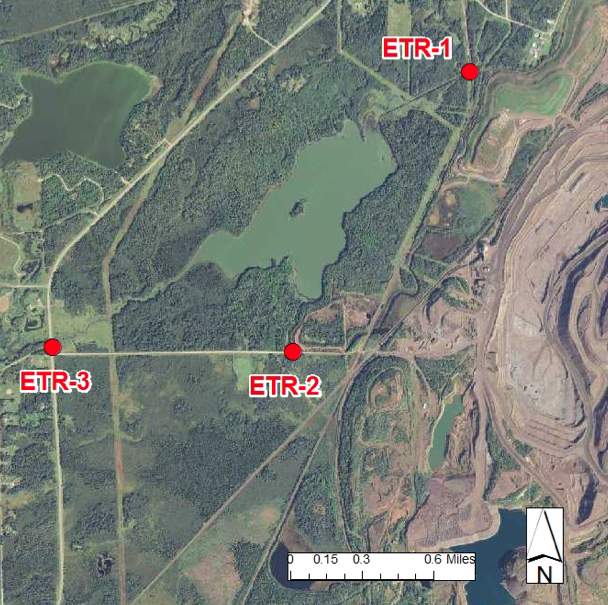 Right: researchers with the Minnesota DNR have been performing long term leaching experiments to determine the acid- and sulfate-generation potential of various Duluth Complex materials, including mine waste rock and tailings. 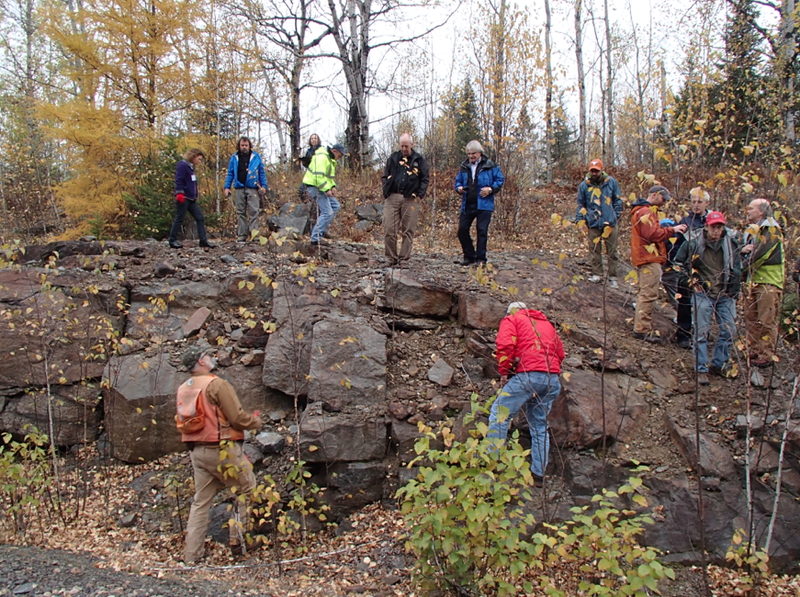 Below left: Sampling large-scale weathering experiments at a DNR field station. Below middle: Sulfur-oxidizing enrichments and isolates from weathered DC samples, initiated by former UROP student An An Hua (below right). Methylmercury is a serious problem in the St. Louis River Watershed, and fish advisories are in effect over much of the St. Louis River. Methylmercury is formed from inorganic mercury by certain anaerobic microorganisms, and is most commonly associated with sulfate-reduction. We are combining molecular techniques and Hg geochemical analyses to determine the microbes responsible for methylmercury production in sulfate-impacted systems. Below: Measuring methylmercury production and the microbes responsible in Lake Manganika, with Dr. Nate Johnson (UMN Duluth) and Dr. Jill Coleman-Wasik (UW River Falls). UMN undergraduate Gabe Walker presenting his research on hgcA genes from Manganika and other locations at a UMN symposium. ​Photos by J. Coleman-Wasik and D. Jones. Right: Lake Manganika, near Virginia, MN. Image from Berndt and Bavin (2011, DNR report, link). High sulfate concentrations are detrimental to wild rice if sulfate is reduced to sulfide in sediments. Wild rice is an important staple food and sacred plant to the Ojibwe (see this site for more information), and it is Minnesota's state grain. 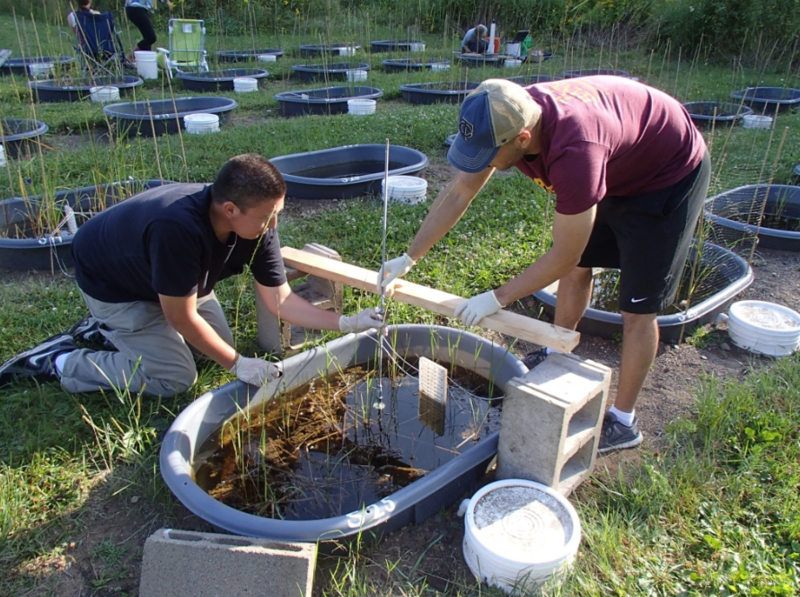 I am involved in a new project with Dr. John Pastor and Dr. Nate Johnson to study the response of sediment microbial communities to artificially elevated sulfate concentrations in experimental wild rice ecosystems. 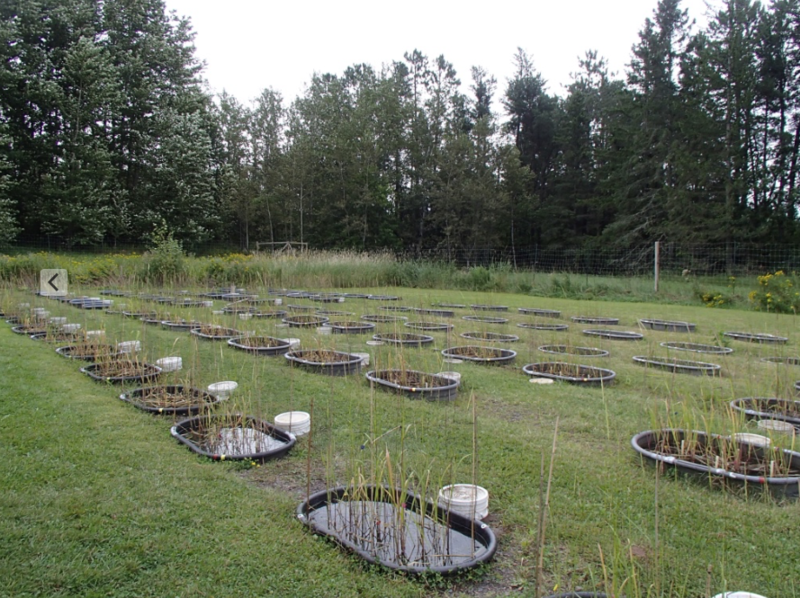 Images below, L to R: Dr. John Pastor's long-term experiment where wild rice has been subjected to elevated sulfate and other treatments. Gabe Walker and Charles Thunder sampling sediments from wild rice mesocosms. Cores collected from low sulfate (left) and high sulfate (right) treatments. 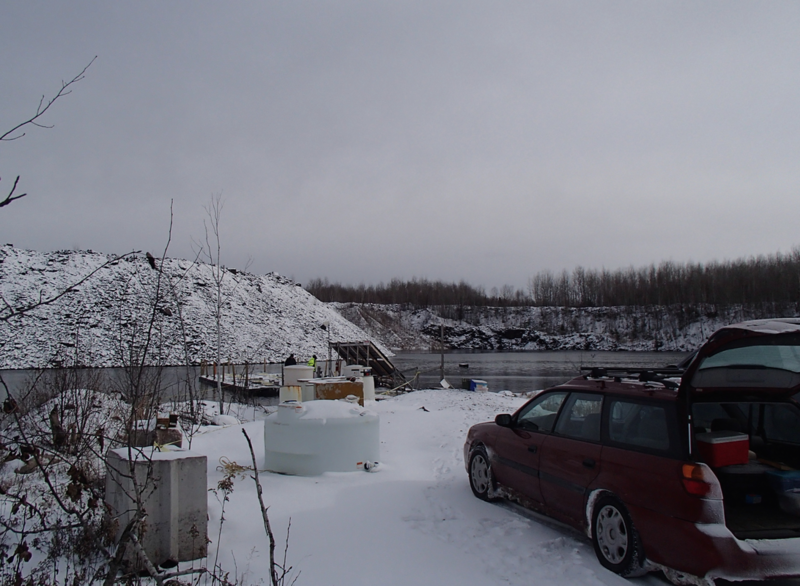 Sulfate is, and arguably will remain, the most challenging environmental pollutant from iron and Cu-Ni mines in Minnesota. Minnesota's sulfate standard for wild rice lakes (10 mg/L) is currently under review by the Minnesota Pollution Control Agency (MPCA), and the MPCA's new proposed site-specific standard would require sulfate levels in waters upstream of most wild rice lakes to be well below Minnesota’s sulfate limit for drinking water of 250 mg/L. 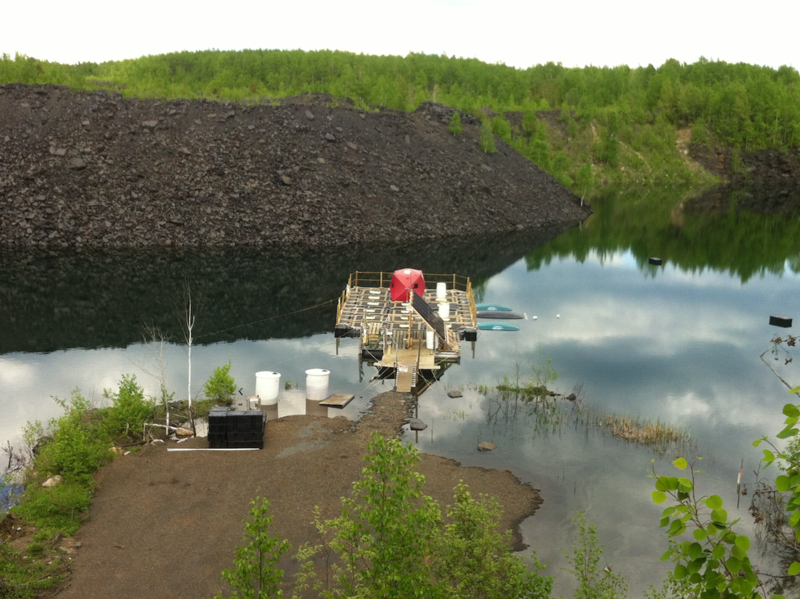 I am part of a large team, led by Clearwater Layline LLC and the Natural Resources Research Institute, studying pilot-scale bioreactors for biological sulfate treatment in taconite pit lakes (pictured below). 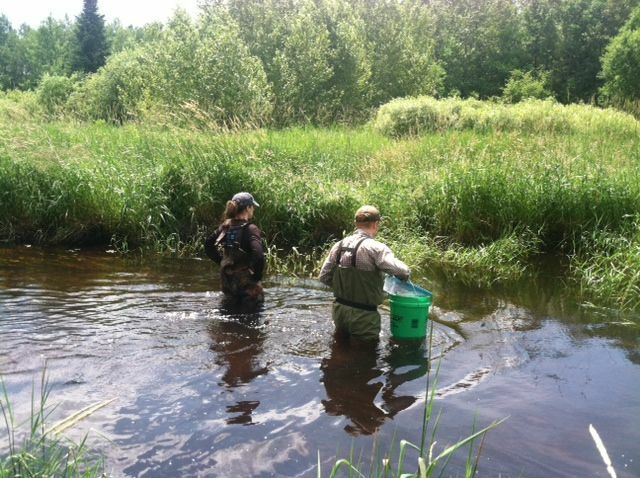 ​Above: Sampling in the Partridge River and Second Creek, with Mike Berndt and Megan Kelly (MN DNR), summer 2013. Left two images, Partridge River, Right, Second Creek. 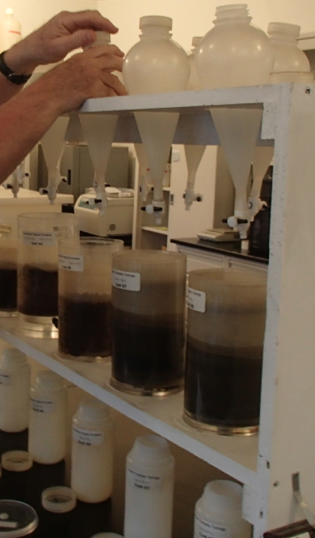 Right: Charles Thunder and I sampling sediment cores collected from a taconite tailings basin. 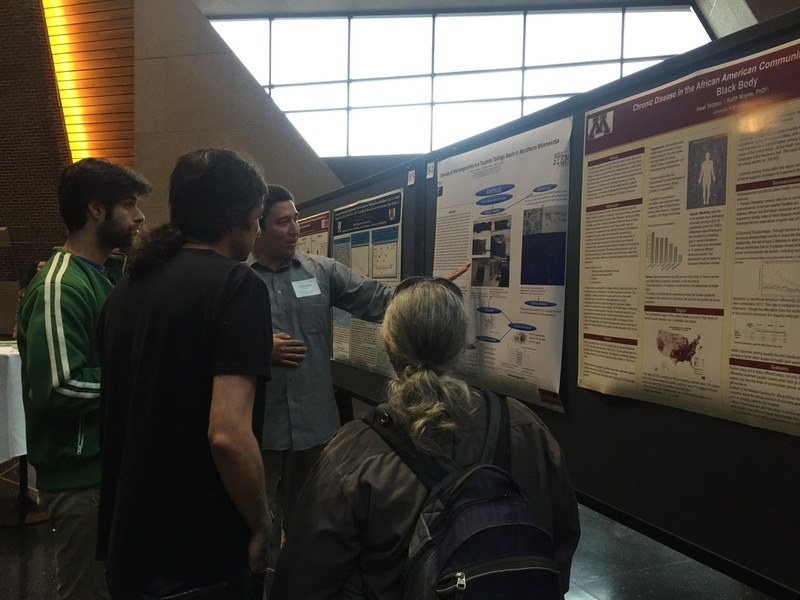 Far right: Charles presenting his summer research at a UMN symposium. 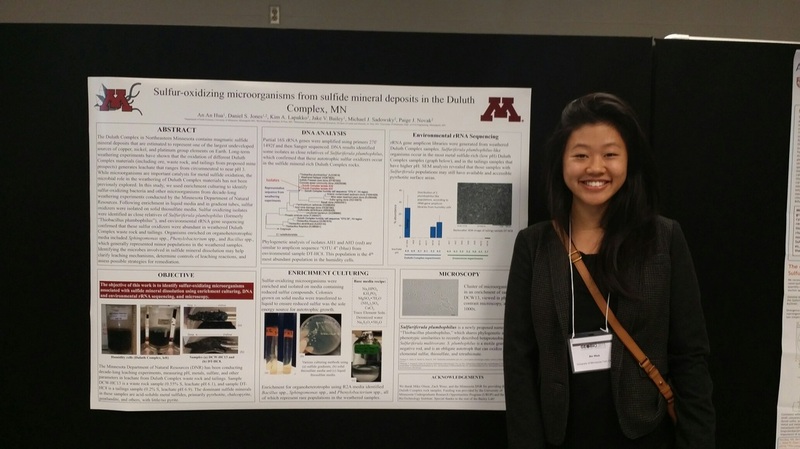 Charles studied microbial diversity and biogeochemistry in a taconite tailings basin. ​Chris Mahr, who recently defended his Master's, preparing to sample a core from Perch Lake, one of several wild rice lakes he studied for his graduate research. Eutrophication selfies! Images taken with my camera ~5 cm underwater, looking up. Lake McQuade (left) versus Lake Manganika (right). 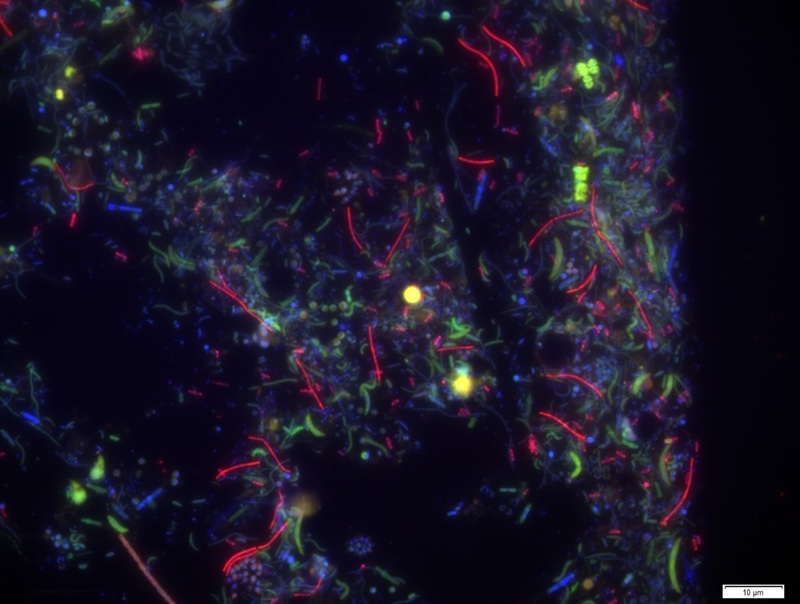 Below, FISH image showing methanogenic archaea (in red) in Lake Manganika sediments. Extremely high productivity in Lake Manganika leads to the formation of anoxic bottom waters.